Whoever praises his own religion, due to excessive devotion, and condemns others with the thought "Let me glorify my own religion," only harms his own religion. Therefore contact (between religions) is good. One should listen to and respect the doctrines professed by others. 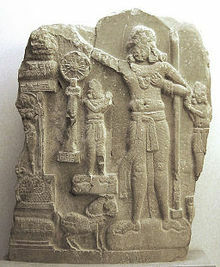 Ashoka the Great (Devanagari: अशोक; IAST transliteration: Aśoka, 304 BCE – 232 BCE), known also as Piyadasi (Pali. Sanskrit:Priyadarśin – meaning 'good looking'), and Devanaŋpiya (Pali. Sanskrit:Devānāmpriya meaning 'beloved of the Gods'), was the emperor of the Mauryan Empire from 273 BCE to 232 BCE. 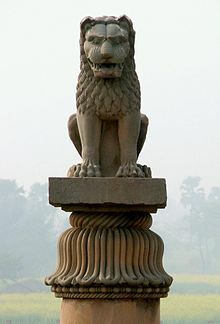 After a number of military conquests, Ashoka reigned over most of South Asia and beyond, from present-day Afghanistan to Bengal and as far south as Mysore. 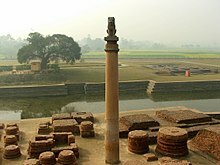 An early supporter of Buddhism, Ashoka established monuments marking several significant sites in the life of Shakyamuni Buddha, and according to Buddhist tradition was closely involved in the preservation and transmission of Buddhism. The name "Ashoka" means "without sorrow" in Sanskrit. Ashoka was the first ruler of ancient Bharatavarsha (India), after the famed Mahabharata rulers, to unify such a vast territory under his empire, which exceeds the boundaries of the present-day Republic of India. King Piodasses made known Piety to men; and from this moment he has made men more pious, and everything thrives throughout the whole world. Ten years (of reign) having been completed, King Piodasses (Piyadassi) made known (the doctrine of) Piety to men; and from this moment he has made men more pious, and everything thrives throughout the whole world. And the king abstains from (killing) living beings, and other men and those who (are) huntsmen and fishermen of the king have desisted from hunting. And if some (were) intemperate, they have ceased from their intemperance as was in their power; and obedient to their father and mother and to the elders, in opposition to the past also in the future, by so acting on every occasion, they will live better and more happily. "The Greek Section of the Kandahar Inscription" as translated by G. P. Carratelli in A Bilingual Graeco-Aramaic Edict by Aśoka: The First Greek Inscription Discovered in Afghanistan (1964) edited by G. P. Carratelli and G. Garbini, p. 32; Piyadassi is one of the titles of Ashoka, meaning Beloved of the Gods, "Piety" here is a translation of the Greek εὐσέβεια, Eusebeia. Using primarily Girnar version of the edicts, issued in 257 B.C. Beloved-of-the-Gods thinks that even those who do wrong should be forgiven where forgiveness is possible. King Piyadasi, does not consider glory and fame to be of great account unless they are achieved through having my subjects respect Dhamma and practice Dhamma, both now and in the future. Beloved-of-the-Gods, King Piyadasi, does not value gifts and honors as much as he values this — that there should be growth in the essentials of all religions. Dhamma is good, but what constitutes Dhamma? (It includes) little evil, much good, kindness, generosity, truthfulness and purity. This leads to happiness in this world and the next. Progress among the people through Dhamma has been done by two means, by Dhamma regulations and by persuasion. Of these, Dhamma regulation is of little effect, while persuasion has much more effect. Beloved-of-the-Gods, King Piyadasi, has caused this Dhamma edict to be written. Here (in my domain) no living beings are to be slaughtered or offered in sacrifice. Formerly, in the kitchen of Beloved-of-the-Gods, King Piyadasi, hundreds of thousands of animals were killed every day to make curry. But now with the writing of this Dhamma edict only three creatures, two peacocks and a deer are killed, and the deer not always. And in time, not even these three creatures will be killed. Everywhere within Beloved-of-the-Gods, King Piyadasi's domain, and among the people beyond the borders, the Cholas, the Pandyas, the Satiyaputras, the Keralaputras, as far as Tamraparni and where the Greek king Antiochos rules, and among the kings who are neighbours of Antiochos, everywhere has Beloved-of-the-Gods, King Piyadasi, made provision for two types of medical treatment: medical treatment for humans and medical treatment for animals. Wherever medical herbs suitable for humans or animals are not available, I have had them imported and grown. Wherever medical roots or fruits are not available I have had them imported and grown. Along roads I have had wells dug and trees planted for the benefit of humans and animals. Respect for mother and father is good, generosity to friends, acquaintances, relatives, Brahmans and ascetics is good, not killing living beings is good, moderation in spending and moderation in saving is good. The Council shall notify the Yuktas about the observance of these instructions in these very words. To do good is difficult. One who does good first does something hard to do. I have done many good deeds, and, if my sons, grandsons and their descendants up to the end of the world act in like manner, they too will do much good. But whoever amongst them neglects this, they will do evil. Truly, it is easy to do evil. Beloved-of-the-Gods, King Piyadasi, desires that all religions should reside everywhere, for all of them desire self-control and purity of heart. But people have various desires and various passions, and they may practice all of what they should or only a part of it. But one who receives great gifts yet is lacking in self-control, purity of heart, gratitude and firm devotion, such a person is mean. Beloved-of-the-Gods, King Piyadasi, does not consider glory and fame to be of great account unless they are achieved through having my subjects respect Dhamma and practice Dhamma, both now and in the future. For this alone does Beloved-of-the-Gods, King Piyadasi, desire glory and fame. And whatever efforts Beloved-of-the-Gods, King Piyadasi, is making, all of that is only for the welfare of the people in the next world, and that they will have little evil. And being without merit is evil. This is difficult for either a humble person or a great person to do except with great effort, and by giving up other interests. In fact, it may be even more difficult for a great person to do. There is no gift like the gift of the Dhamma, (no acquaintance like) acquaintance with Dhamma, (no distribution like) distribution of Dhamma, and (no kinship like) kinship through Dhamma. And it consists of this: proper behavior towards servants and employees, respect for mother and father, generosity to friends, companions, relations, Brahmans and ascetics, and not killing living beings. Therefore a father, a son, a brother, a master, a friend, a companion or a neighbor should say: "This is good, this should be done." One benefits in this world and gains great merit in the next by giving the gift of the Dhamma. Beloved-of-the-Gods, King Piyadasi, honors both ascetics and the householders of all religions, and he honors them with gifts and honors of various kinds. But Beloved-of-the-Gods, King Piyadasi, does not value gifts and honors as much as he values this — that there should be growth in the essentials of all religions. Growth in essentials can be done in different ways, but all of them have as their root restraint in speech, that is, not praising one's own religion, or condemning the religion of others without good cause. And if there is cause for criticism, it should be done in a mild way. But it is better to honor other religions for this reason. By so doing, one's own religion benefits, and so do other religions, while doing otherwise harms one's own religion and the religions of others. Whoever praises his own religion, due to excessive devotion, and condemns others with the thought "Let me glorify my own religion," only harms his own religion. Therefore contact (between religions) is good. One should listen to and respect the doctrines professed by others. Beloved-of-the-Gods, King Piyadasi, desires that all should be well-learned in the good doctrines of other religions. Beloved-of-the-Gods, King Piyadasi, conquered the Kalingas eight years after his coronation. One hundred and fifty thousand were deported, one hundred thousand were killed and many more died (from other causes). After the Kalingas had been conquered, Beloved-of-the-Gods came to feel a strong inclination towards the Dhamma, a love for the Dhamma and for instruction in Dhamma. Now Beloved-of-the-Gods feels deep remorse for having conquered the Kalingas. Indeed, Beloved-of-the-Gods is deeply pained by the killing, dying and deportation that take place when an unconquered country is conquered. But Beloved-of-the-Gods is pained even more by this — that Brahmins, ascetics, and householders of different religions who live in those countries, and who are respectful to superiors, to mother and father, to elders, and who behave properly and have strong loyalty towards friends, acquaintances, companions, relatives, servants and employees — that they are injured, killed or separated from their loved ones. Even those who are not affected (by all this) suffer when they see friends, acquaintances, companions and relatives affected. These misfortunes befall all (as a result of war), and this pains Beloved-of-the-Gods. There is no country, except among the Greeks, where these two groups, Brahmins and ascetics, are not found, and there is no country where people are not devoted to one or another religion. Therefore the killing, death or deportation of a hundredth, or even a thousandth part of those who died during the conquest of Kalinga now pains Beloved-of-the-Gods. Now Beloved-of-the-Gods thinks that even those who do wrong should be forgiven where forgiveness is possible. You must attend to this matter. While being completely law-abiding, some people are imprisoned, treated harshly and even killed without cause so that many people suffer. Therefore your aim should be to act with impartiality. It is because of these things — envy, anger, cruelty, hate, indifference, laziness or tiredness — that such a thing does not happen. Therefore your aim should be: "May these things not be in me." And the root of this is non-anger and patience. Those who are bored with the administration of justice will not be promoted; (those who are not) will move upwards and be promoted. Whoever among you understands this should say to his colleagues: "See that you do your duty properly. Such and such are Beloved-of-the-Gods' instructions." Great fruit will result from doing your duty, while failing in it will result in gaining neither heaven nor the king's pleasure. Failure in duty on your part will not please me. But done properly, it will win you heaven and you will be discharging your debts to me. The people of the unconquered territories beyond the borders might think: "What is the king's intentions towards us?" My only intention is that they live without fear of me, that they may trust me and that I may give them happiness, not sorrow. Furthermore, they should understand that the king will forgive those who can be forgiven, and that he wishes to encourage them to practice Dhamma so that they may attain happiness in this world and the next. I am telling you this so that I may discharge the debts I owe, and that in instructing you, that you may know that my vow and my promise will not be broken. Therefore acting in this way, you should perform your duties and assure them (the people beyond the borders) that: "The king is like a father. He feels towards us as he feels towards himself. We are to him like his own children." Beloved-of-the-Gods speaks thus: Father and mother should be respected and so should elders, kindness to living beings should be made strong and the truth should be spoken. In these ways, the Dhamma should be promoted. Likewise, a teacher should be honored by his pupil and proper manners should be shown towards relations. This is an ancient rule that conduces to long life. Thus should one act. Dhamma is good, but what constitutes Dhamma? (It includes) little evil, much good, kindness, generosity, truthfulness and purity. I have given the gift of sight in various ways. To two-footed and four-footed beings, to birds and aquatic animals, I have given various things including the gift of life. And many other good deeds have been done by me. People see only their good deeds saying, "I have done this good deed." But they do not see their evil deeds saying, "I have done this evil deed" or "This is called evil." But this (tendency) is difficult to see. One should think like this: "It is these things that lead to evil, to violence, to cruelty, anger, pride and jealousy. Let me not ruin myself with these things." And further, one should think: "This leads to happiness in this world and the next." Whatever good deeds have been done by me, those the people accept and those they follow. Therefore they have progressed and will continue to progress by being respectful to mother and father, respectful to elders, by courtesy to the aged and proper behavior towards Brahmans and ascetics, towards the poor and distressed, and even towards servants and employees. This progress among the people through Dhamma has been done by two means, by Dhamma regulations and by persuasion. Of these, Dhamma regulation is of little effect, while persuasion has much more effect. The Dhamma regulations I have given are that various animals must be protected. And I have given many other Dhamma regulations also. But it is by persuasion that progress among the people through Dhamma has had a greater effect in respect of harmlessness to living beings and non-killing of living beings. When Buddhism first emerges in what may be termed the light of history, it is as an established system highly favoured by the great king Asoka, about 250 B.C. It is made clear by his edicts that only a small number of scriptures, whose titles are only partially identifiable with known extant writings, were then recognised as preserving the spoken discourses of the Buddha. Asoka (264 to 227 B.C. ), one of the great monarchs of history, whose dominions extended from Afghanistan to Madras... is the only military monarch on record who abandoned warfare after victory. He had invaded Kalinga (255 B.C. ), a country along the east coast of Madras, perhaps with some intention of completing the conquest of the tip of the Indian peninsula. The expedition was successful, but he was disgusted by what be saw of the cruelties and horrors of war. 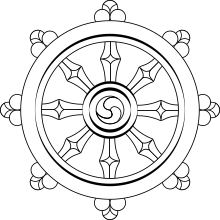 He declared, in certain inscriptions that still exist, that he would no longer seek conquest by war, but by religion, and the rest of his life was devoted to the spreading of Buddhism throughout the world. He seems to have ruled his vast empire in peace and with great ability. He was no mere religious fanatic. For eight and twenty years Asoka worked sanely for the real needs of men. Amidst the tens of thousands of names of monarchs that crowd the columns of history, their majesties and graciousnesses and serenities and royal highnesses and the like, the name of Asoka shines, and shines, almost alone, a star. From the Volga to Japan his name is still honoured. China, Tibet, and even India, though it has left his doctrine, preserve the tradition of his greatness. More living men cherish his memory to-day than have ever heard the names of Constantine or Charlemagne. In the history of the world there have been thousands of kings and emperors who called themselves "their highnesses," "their majesties," and "their exalted majesties" and so on. They shone for a brief moment, and as quickly disappeared. But Ashoka shines and shines brightly like a bright star, even unto this day. Wikisource has the text of the 1911 Encyclopædia Britannica article Asoka.